I love bread. In all honesty, I love most forms that starch takes, but good artisan bread holds a special place in my heart. 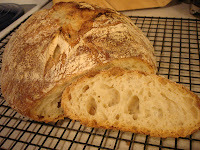 Crispy, crackling crust; chewy, open crumb; deep, complex flavor. I love it. And, as any good do-it-yourselfer would, I have, on occasion, attempted to replicate my favorite bakery breads at home. Unfortunately, my attempts were largely unsuccessful. Don't get me wrong, I have baked many respectable, sturdy, and even tasty loaves of bread. The aforementioned qualities that make artisan bread so appealing, however, have always eluded me. A few days ago, though, I ran across the book My Bread by Jim Lahey. He is the founder of the Sullivan Street Bakery in New York and emphasizes high-quality, Italian-style breads. On November 8, 2006, Mark Bittman of the New York Times published a piece about Jim Lahey's no-knead breadmaking method and it proved quite popular (article available through NY Times website). Essentially, in Lahey's bread, the all-important gluten is developed during a long fermentation period, rather than through traditional kneading. The dough prep is only the first simple step in this amazing recipe. Then comes the real magic. 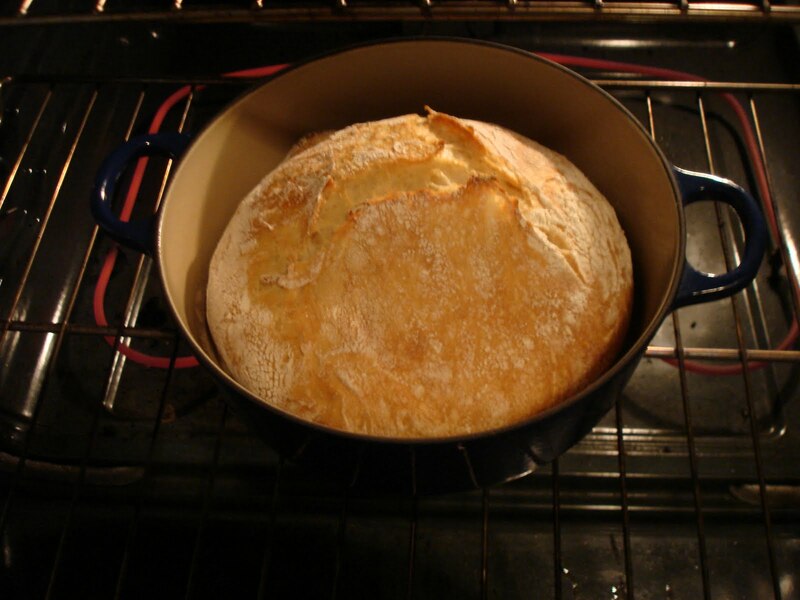 The bread is baked in a preheated, covered cast iron (or ceramic) vessel which approximates the enviornment created by professional steam-injected ovens. Partway through baking, the lid is removed to allow the crust to darken. This covered vessel aspect of the method produces that beautiful, elusive, crackling crust in your own oven. Seriously, once my bread had cooled and I sliced it, I almost cried with joy when I saw the crumb. It was gorgeous, thanks to this virtually foolproof recipe and method (it certainly was not the result of any special breadmaking talent on my part). Before I could achieve this near-miracle, though, there was a certain preliminary matter to deal with. 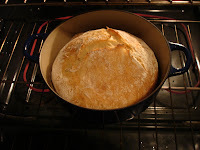 I have several cast iron Dutch ovens for the baking, so that wasn't a problem, but the recipe requires an oven temperature of 475 degrees F and the standard black Le Creuset handles are only rated for 375 degrees. Le Creuset produces stainless steel replacement knobs that retail for $14, but can be purchased for $10 through Amazon. I am frugal, however, and more importantly I am annoyed by the notion of paying hundreds of dollars for a pot and then having to shell out more money for a fully functioning handle. America's Test Kitchen suggested drawer pulls as replacements for the plastic knobs, so my husband and I went off to the hardware store. They are way less expensive than the Le Creuset handles and provide an excellent opportunity to add a little flair to your cookware. I suggest a few key criteria when shopping for knobs: stainless steel (or a similarly heat-resistant metal), a base wide enough that it will not slip through the hole in the lid, enough space between the base of the pull and the head so that it can be comfortably gripped, a well-sized knob (can you grab it with an oven mitt on? ), and I tried to find something that wouldn't look completely out of place sitting on top of a Dutch oven. I selected one of the more expensive styles of pull, but at $3 apiece, the handles were still incredibly well-priced compared to Le Creuset's knob. The screw that comes with the drawer pull will probably be too long (the lid being much thinner than a drawerfront). You could purchase a shorter screw, making sure that the head of the screw will not slip through the hole in the lid and, of course, that it is the correct size for your drawer pull. 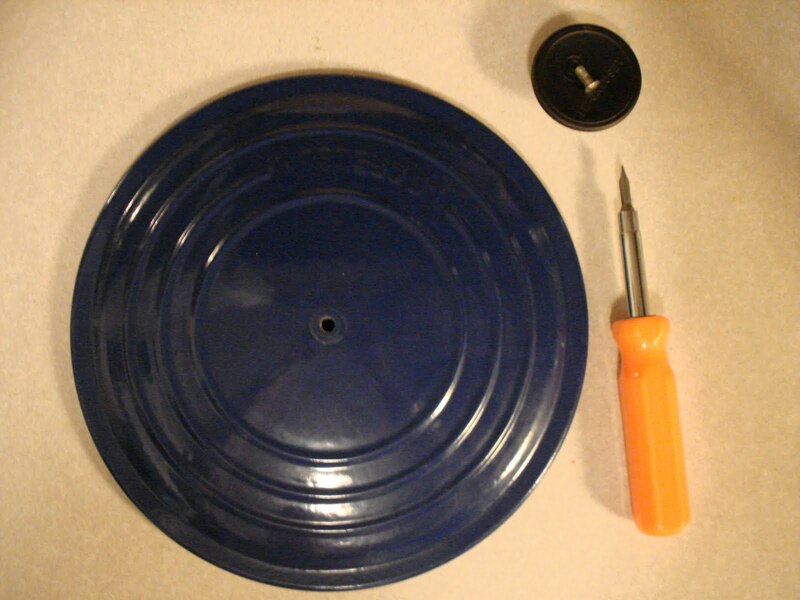 If you are lucky enough, the original screw from the Le Creuset plastic knob may fit your new handle. Alternatively, if you have the means to do so, you can cut the drawer pull's screw to the correct length (this is what we did, worked like a charm). I should say, Jim Lahey's recipe does not require a Le Creuset Dutch oven. I highly recommend baking his bread recipe in whatever suitable vessel you can find because it is so outrageously good. For example, I read numerous stories online about people baking bread, with great success, in presoaked terra cotta pots (althouh I would try to be sure that the terra cotta was lead-free before using it for high-heat baking). 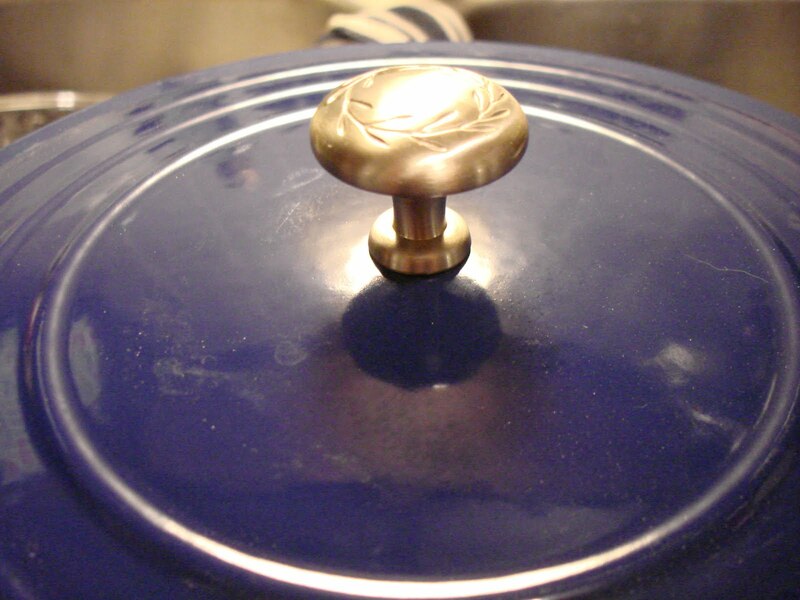 If you do have Le Creuset cast iron, though, you may consider replacing your standard knobs with something a little more durable for high-heat cooking. Be creative and enjoy! *Note: Jim Lahey's basic recipe calls for bread flour because it generally has a higher protein content than all-purpose flour. However, King Arthur unbleached all-purpose flour has a higher protein content than other brands of flour (roughly 11.7%) (see Rose Levy Beranbaum's Bread Bible ), so I substituted it for the bread flour. It produced a great loaf. My mouth is watering after reading this article. George and I LOVE good bread! Thanks, Debbie! 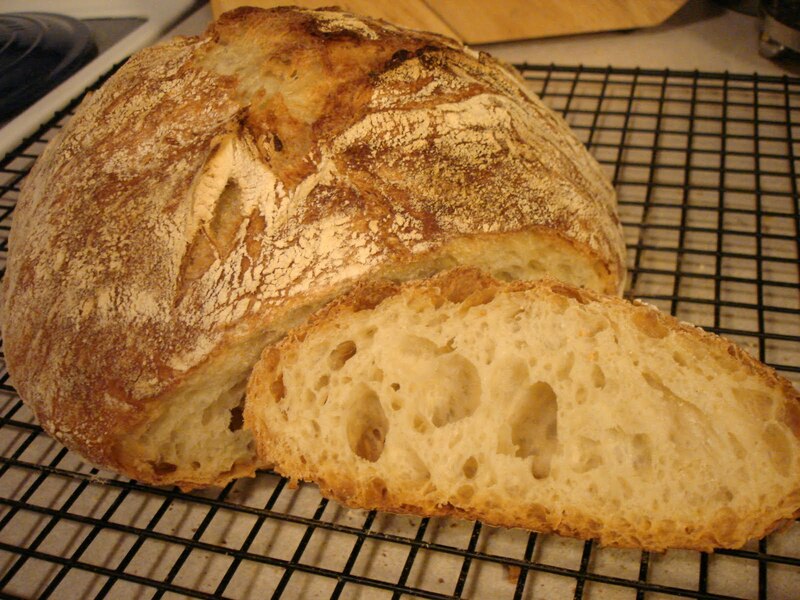 I'll have an update on this post soon -- I've made baguettes and ciabatta using this method so far. Yay, Jim Lahey!